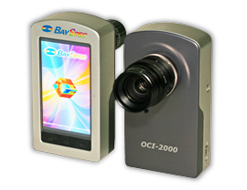 BaySpec’s Compact OCI-2000™ Snapshot Spectral Imager brings for the first time high performance hyperspectral/multispectral real-time imaging in a compact handheld form factor weighing only 0.8 lbs. (363 grams). The imager acquires full, VIS-NIR hyperspectral/multispectral data with high spectral resolution at one snapshot. Continuous hyperspectral data capturing can happen at video rates. Hyperspectral/multispectral cameras, compared to traditional cameras, divide the light spectrum into many small wavelength bands. Therefore, a Hyperspectral camera can capture the spectral fingerprints as spectral signatures from an object. These spectral signatures give very detailed information about the material constitutions of the imaged object. Hyperspectral/multispectral imaging considerably improves the identification and classification of objects and is today recognized as a key enabling technology for next-generation industrial inspection, medical diagnosis and security applications.